Short of winning the lottery, a 0% probability since I don’t buy the necessary tickets, there is no way I will ever be able to afford any of the Phillies from the 1886 MacIntire Studio set. Thus, it’s impossible that I’ll ever own a card of Cannonball Titcomb, the man who possesses the greatest name in team history. 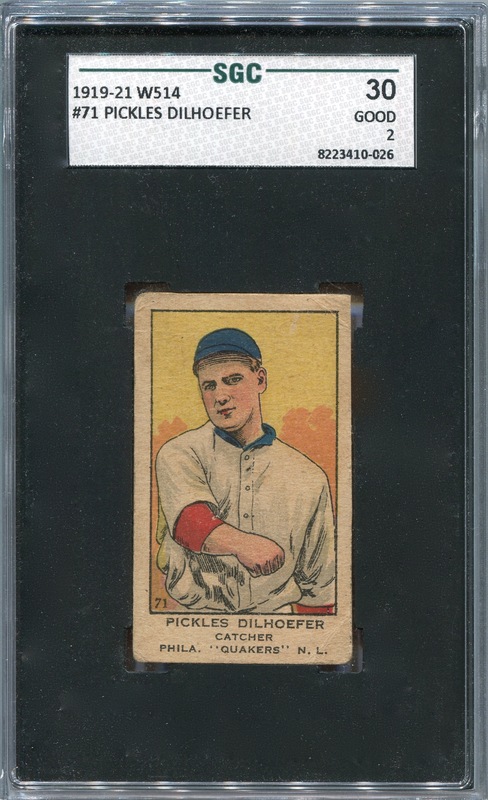 However, during my recent hiatus from posting I picked up the next best thing: a Pickles Dilhoefer card. I truly don’t believe there is a player in team history who both bears a name as colorful as either Dilhoefer’s or Titcomb’s and appears on a baseball card as a member of the Phillies. On a related note, the appalling lack of colorful nicknames among modern ballplayers truly is a travesty. Outside of Chooch, there just hasn’t been very many of them on the Phils over the past 30 years.